The Lovespoon Workshop, specialists in Welsh lovespoons. 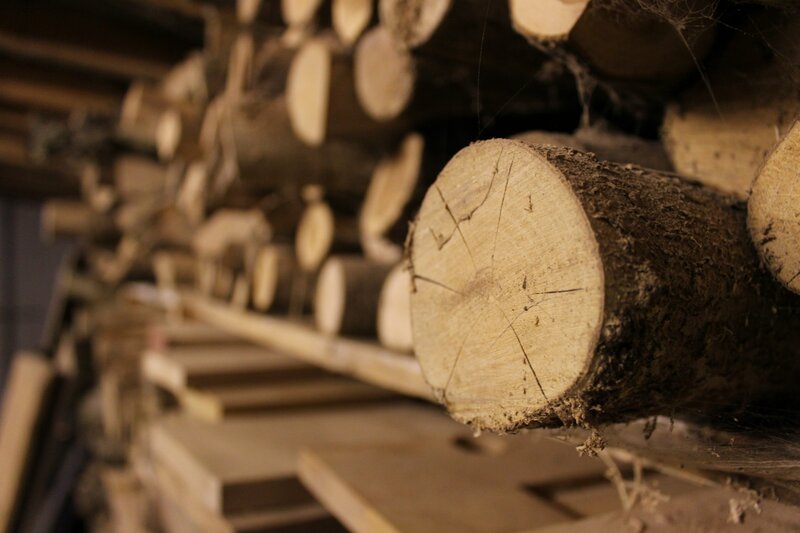 Handcrafted with care from log to lovespoon. 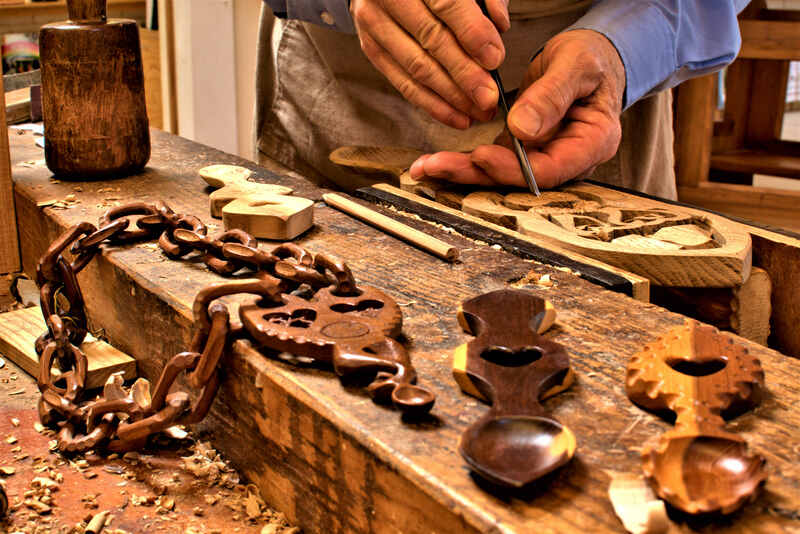 Handcarving Welsh lovespoons in the heart of Wales. Sharing our passion for the lovespoon tradition with the wider world. 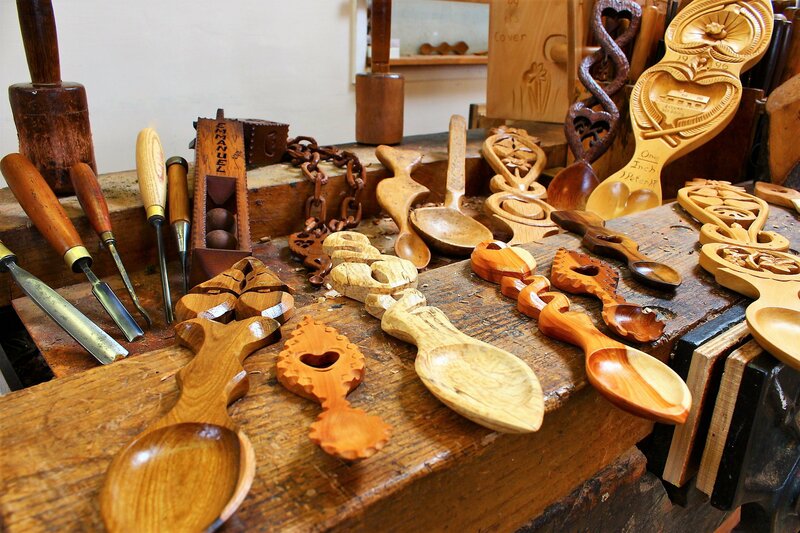 Welcome to The Lovespoon Workshop online, the home of genuine Welsh Lovespoons that have been hand carved by The Thomas Family at The Lovespoon Workshop, near Tenby in Pembrokeshire since 1975. Continuing the 17th century Welsh lovespoon tradition in Wales today and sharing it with the wider world. Through The Lovespoon Workshop online, the Thomas family bring our unique range of traditional hand carved Welsh lovespoons to a digital audience. All of our lovespoons are made from wood from sustainable sources, priding ourselves on being an eco business. We hope you will enjoy our range of lovespoons that we have lovingly handmade, all being available to be personalised as a beautiful keepsake or a wonderful way to record that special occasion just for you. To check out our online lovespoon range follow the link below or in the drop down menu above. We are dedicated specialists in the field of Welsh lovespoons so if you are looking for something a little different scroll down the page to the link for our Bespoke Lovespoon Service and feel free to share your design ideas with us. The 17th century Welsh tradition of carving lovespoons as tokens of affection and love continues in Wales today here at The Lovespoon Workshop. Lovespoons can be used to record various special occasions, including engagements, anniversaries, weddings and births. Today our lovespoons are also used as an acknowledgement of friendship as well as being given to a loved one. Often our lovespoons are even used as a reminder of a special time spent visiting Wales. 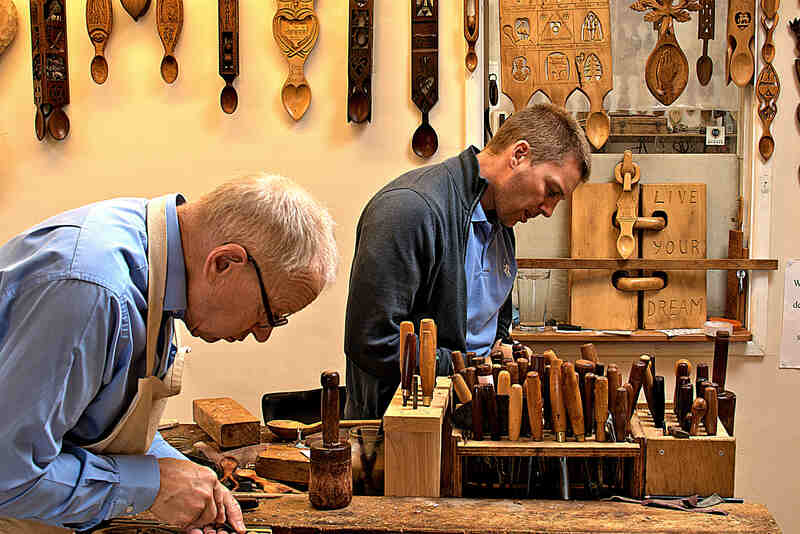 Father and son handcarving lovespoons together at The Lovespoon Workshop. Click here to find out about the Thomas family and the Welsh lovespoon. Lovespoons vary greatly in their intricacy, from the plain and simple to the elaborate and complicated but all of our lovespoons have a story to tell. The Welsh lovespoon has shown an ability to adapt and evolve. For the maker it can cater for greatly varied ability levels and the recipient can have greatly varied tastes regarding style and design. A simple heart and bowl design can be as meaningful to the recipient as one that has numerous hours of toil. 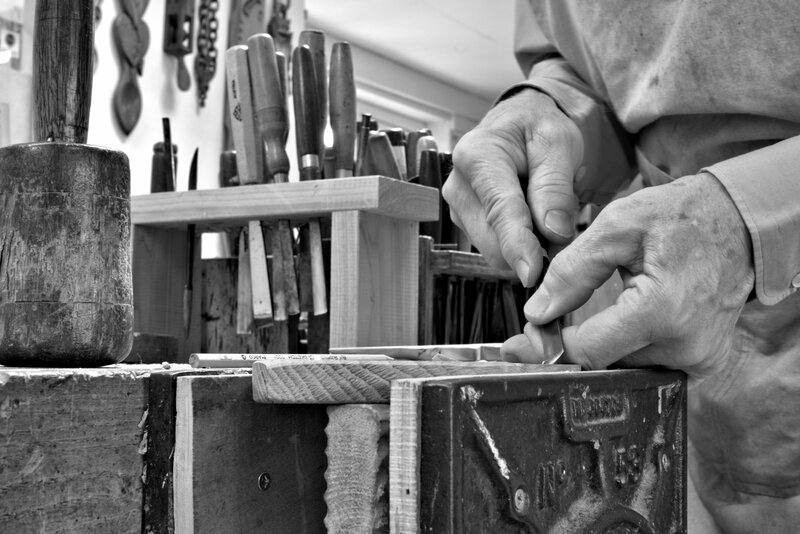 The making of a lovespoon can give true meaning to the idea of a labour of love. Styles used when designing a lovespoon can be equally diverse, from traditional, to Celtic, to more modern. Unlike other areas of modern life few rules are needed and applied when it comes to the making of a lovespoon. Our bespoke lovespoon service gives you the chance to be involved in designing your perfect lovespoon. check out the link below for our brand new DVD exclusively from The Lovespoon Workshop. The Lovespoon Workshop is located in the centre of the small hamlet of Cold Inn. It is in close proximity to the beautiful seaside resorts of Tenby and Saundersfoot and only 800yrds from the main A477 Pembroke Dock ferry road. From Kilgetty take the main A477 towards Pembroke and turn left at the traffic lights and cross roads in Broadmoor. Continue into Cold Inn and The Lovespoon Workshop is situated in the centre of Cold Inn on the left hand side. Just look for the lovespoon on the wall of the workshop. Thinking of enjoying a holiday here in beautiful Pembrokeshire? Check out our holiday home The Lovespoon House, next door to The Lovespoon Workshop itself and available for bookings for families and groups up to four all year round.